Content Management System (CMS) is a software or a suite of applications deployed to input and manage content on a website seamlessly. It is an interface or a medium for the creation, edition or modification, review and publishing of material on a site and enabling multiple users to upload content at the same time and work collaboratively on the website. CMSs are typically used for enterprise content management (ECM) and web content management (WCM). An ECM facilitates collaboration in the workplace by integrating document management, digital asset management, and records retention functionalities and providing end users with role-based access to the organization’s digital assets. A web content management system (WCM or WCMS) is a CMS designed to support the management of the content of web pages. A WCM facilitates collaborative authoring for websites. ECM software often includes a WCM publishing functionality, but ECM web pages typically remain behind the organization’s firewall. Content in a CMS is typically stored in a database and displayed in a presentation layer based on a set of templates. CMS offers a web-based graphic user interface (GUI) enabling publishers to access CMS through a web browser. 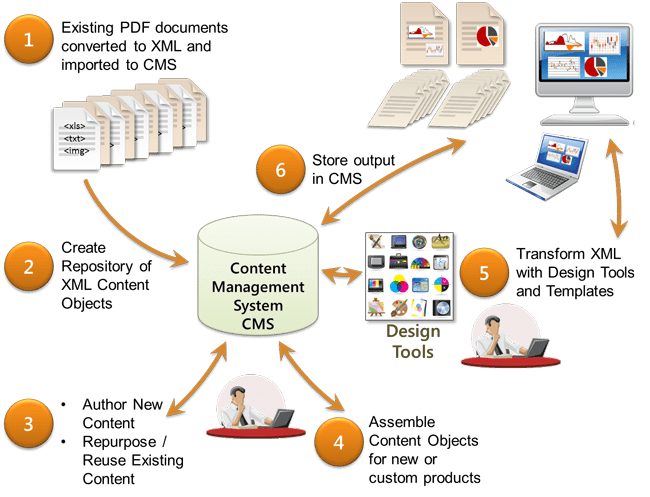 CMS designed for web publishing provides options and features such as indexing and search of documents and also specifying keywords and metadata for search engine crawlers, etc. At the same time, the CMS abstracts away the low-level details unless they are required. Presentation (enhancement features often come standard with CMS, giving the site improved functionality, navigation, and interactivity. Some WCMS systems support user groups, which control how registered users interact with the site. A page on the site can be restricted to one or more groups. This means an anonymous user (someone not logged on), or a logged on user who is not a member of the group yet, is denied access. Create standard templates (usually HTML and XML) that users can apply to new and existing content, changing the appearance of all content from one central place. WCMS software may act as a collaboration platform where many users retrieve and work on content. Changes can be tracked and authorized for publication or ignored reverting to old versions. Other advanced forms of collaboration allow multiple users to modify or comment on a page at the same time in a collaboration session. WCMS software often helps distribute content by generating RSS and Atom data feeds to other systems. They may also e-mail users when updates become available. WCMS software may provide a means of allowing each user to work within a virtual copy of the entire web site, document set, and/or code base. This enables viewing changes to multiple interdependent resources in context prior to submission. 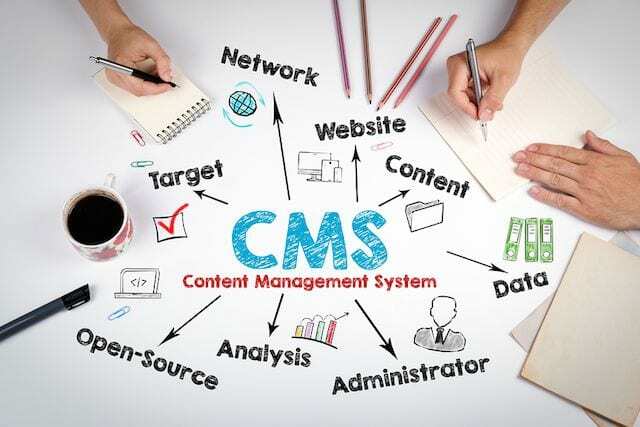 Some WCMS software allows for various user groups to have limited privileges over specific content on the website, spreading out the responsibility of content management. WCMS software may provide a means of collaboratively managing the life cycle of a document from initial creation time, through revisions, publication, archive, and document destruction. Once content is separated from the visual presentation of a site, it usually becomes much easier and quicker to edit and manage. Most WCMS software includes WYSIWYG editing tools allowing non-technical users to create and edit content. Format management turn scanned paper documents and legacy electronic documents into HTML or PDF documents. Intuitive indexing, search and retrieval features index all data for easy access through search functions and allows users to search by attributes such as publication dates, keywords or author. Many WCMSs can display content in multiple languages. Available in most modern WCMSs is the ability to expand a single implementation (one installation on one server) across multiple domains, depending on the server’s settings. WCMS sites may be able to create microsites/web portals within the main site as well. Workflow is the process of creating cycles of sequential and parallel tasks that must be accomplished in the WCMS. For example, one or many content creators can submit a story, but it is not published until the copy editor cleans it up and the editor-in-chief approves it. Like document management systems, WCMS software may implement version control, by which users check pages in and out of the WCMS. Authorized editors can retrieve previous versions and work from a selected point. Versioning is useful for content that changes and requires updating, but it may be necessary to start from or reference a previous version. One major advantage of a CMS is its collaborative nature. Multiple users can log on and contribute, schedule or edit content to be published. Because the interface is usually browser-based, a CMS can be accessed from anywhere by any number of users. The second major advantage of a CMS is that it allows non-technical people who don’t know programming languages to easily create and manage their own web content. The WYSIWYG (What You See Is What You Get) editors of a typical content management platform allow users to enter text and upload images without needing to know any HTML or CSS. When a company uses a CMS to publish its pages, it reduces its reliance on front-end engineers to make changes to the website, making it quicker and easier to publish new content. Essentially CMS is an interface for the management of the content of a website. Both enterprise content management and web content management systems have two components: Content Management Application (CMA) and Content Delivery Application (CDA). Content Management Application is a front-end graphical user interface (GUI) used to add, modify, remove content from a website even with limited expertise and without any knowledge of HTML. The CDA component provides the back-end services that support management and delivery of the content once it has been created in the CMA. Content Delivery Application compiles that information and updates the site. CMSs come in all shapes and sizes, each with its own set of features and benefits. Some are ideally suited for blogging; others may be tailored to e-commerce sites with features for pricing and accounting functionality. Specifics will vary based on the company’s needs and resources. Answering the below questions can help us select the right content management system for our business or organization. Does the CMS has APIs and Supports Integrations with other Apps and Microservices? Whether we want to incorporate personalization to our marketing strategy or want to get deep insights into our users’ web interactions and behaviors, businesses, like partners and marketing, require very different apps and microservices to manage their day-to-day work on the website. Marketing demands a solution that can easily integrate with marketing automation tool, business intelligence tool, Google Analytics, and RSS to deliver personalized content. Partners need to connect with devices like the partner management platform, such as NetSuite, to better manage partner alliances. Pick a CMS solution, that has robust APIs and lets us easily connect with third-party tools. Does the CMS provide a high level of Customizability? The best CMS platforms are highly customizable. That means they enable us to add almost any feature we want, which in turn enables us to create more advanced websites. Does the CMS provide Page Editing Functionality? We will need to create various types of pages for our website. Our CMS should provide us with the tools we will need to get the job done. Does the CMS provide Content Taxonomy options? The more content the website has, the more important it is to keep everything organized. That’s why a CMS should enable us to create categories, assign tags to our articles, and so on. Does the CMS support Omnichannel? Even if our business is currently only leveraging desktop or mobile sites, it’s important to consider other properties that we haven’t, yet, looked into, but could benefit from in the future. Currently, content exists in the form of AR/VR, mobile, kiosks, digital assistants, jumbotrons, and so on, and there is no sign of this slowing down in the future. How Easy is it to Create and Edit content? The larger the company, the more removed the end user of the CMS will be from the person who implements it. Ideally, the system will be easy to use and intuitive, with features like a WYSIWYG editor. The CMS should provide a way to easily publish new content. Any quality CMS will include a powerful editor, and plenty of options to make sure our content looks top-notch. How large is the Developer Community? Some of the CMS platforms, particularly WordPress and Drupal, come with very large developer communities. The advantage to a sizable community is the amount of online help and documentation we will find on most aspects of customization. CMSs with active communities are under constant development, so we will always have access to updates, security patches and help from other knowledgeable people. How many different Groups Of Users will there be? One consideration will be the various different levels of administrative privileges that are required. Consider the various user roles, including the role of managers in reviewing scheduled content. Having a user-friendly interface is especially important if we have a team that won’t be living in the system every day. They’ll need a solution that is easy-to-use, not require a lot of technical know-how or training and can quickly pick it up when they log back in. Scalability should come as a no-brainer. Change is inevitable for any growing business, and changes impact our websites. Make sure we choose a CMS solution that can quickly grow and scale as needed. If SEO is important to the company, we will want a CMS that automatically handles basic on-page optimization tasks such as title tags, URLs, alt tags on images, and a sound internal linking structure. What Business Operations does the CMS need to Support? Does the company need to publish hundreds of new videos a day? Change prices on thousands of SKUs per day? Host images for blog posts? CMS will have to factor in all these questions and address them. What is the kind of Budget that we have? If we have more budget then we can afford very complex content management systems with features designed to make content creator’s and editor’s lives easier. What Technologies does the CMS need to Support or Integrate with? If the company already uses a CRM, ERP or web analytics program, we will need to consider a CMS that integrates with existing online marketing and other software. There are plenty of options when it comes to picking a content management system for a development project. Depending on how advanced we need the CMS to be, what language it’s built in, and who is going to be using it, it can be a nightmare try. However, some CMS have a slight edge over the rest of the competition because of the usability of the software. Some are just easier to install, use and extend, thanks to some thoughtful planning by the lead developers. 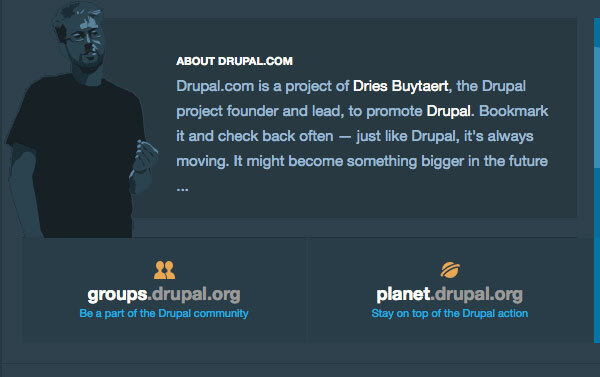 Drupal has a very large, active community. Instead of focusing on blogging as a platform, Drupal is more of a pure CMS. A plain installation comes with a ton of optional modules that can add lots of interesting features like forums, user blogs, OpenID, profiles and more. It’s easy to create a site with social features with a simple install of Drupal. In fact, with a few 3rd party modules we can create some interesting site clones with little effort. One of Drupal’s most popular features is the Taxonomy module, a feature that allows for multiple levels and types of categories for content types. And we can find plenty of professional Drupal Themes, which are ready to be customized and worked with. We can also grab Drupal Plugins. Drupal also has a very active community powering it and has excellent support for plugins and other general questions. 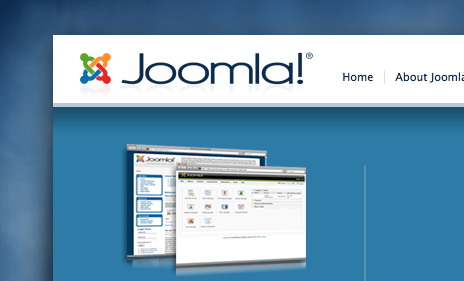 Joomla is a very advanced CMS in terms of functionality. However, getting started with Joomla is fairly easy, thanks to Joomla’s installer. Joomla’s installer is meant to work on commonly shared hosting packages and is very straightforward considering how configurable the software is. Joomla is very similar to Drupal in that it’s a complete CMS. It comes with an attractive administration interface, complete with intuitive drop-down menus and other features. The CMS also has great support for access control protocols like LDAP, OpenID, and even Gmail.com. The Joomla site hosts more than 3,200 extensions, so we know the developer community behind the popular CMS is alive and kicking. We can add just about any needed functionality with an extension. The PHP blogging platform is far and away the most popular CMS for blogging, and probably the most popular CMS overall. WordPress powers around 60% of the entire web. It’s a great platform thanks to their excellent documentation and super-quick installation wizard. Five minutes to a running CMS is pretty good. Not to mention the fact that the newest versions auto-update the core and plugins from within the backend, without having to download a single file. For those users not familiar with HTML or other markup languages, a WYSIWYG editor is provided straight out of the box. The backend layout is streamlined and intuitive and a new user should be able to easily find their way around the administration section. 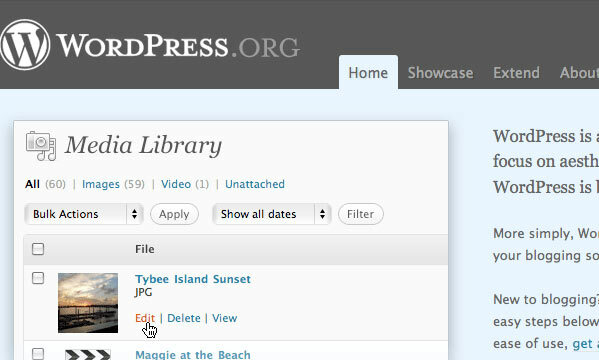 WordPress also comes with built-in image and multimedia uploading support. WordPress has the widest base of plugins and themes to choose from. A great part about the WordPress community is the amount of help and online documentation we can find on nearly every aspect of customizing WordPress. If we can dream it, chances are it’s already been done with WordPress and documented somewhere. WordPress is a free and open source WCMS based on PHP and MySQL. WordPress can be utilized as part of an internet hosting service (WordPress.com), or it can be deployed on a local computer to act as its own web server (WordPress.org). It is immensely popular amongst the blogging community. WordPress allows users to have full control over the files, documents, as well as the design and display of the content. We don’t have to know a single line of code to publish content using WordPress. The beauty of a good content management system is to allow any user to create and manage their content without any technical know-how. Although it is mostly used for web publishing, it can be used to manage content on an intranet, or in a single computer. What Is Personalization In CMS? Personalizing digital experiences is all about content management. Our CMS is a live stage where we’re continually creating dynamic interactions between the data that we collect about visitors and how we structure and serve content. Content personalization (or customization) is a strategy that relies on visitor data to deliver relevant content based on audience interests and motivations. It ranges from a highly targeted call to action to a revolving landing page based on geographic or industry-specific segments. Any data we have access to about the user, the content, or the outside world can be used to personalize a page. Personalization is done through Personalization Rules and Components. The most common personalization rule matches something on the User with something on the content. A WCMS can use one of three approaches: offline processing, online processing, and hybrid processing. These terms describe the deployment pattern for the WCMS in terms of when it applies presentation templates to render web pages from structured content. These systems sometimes referred to as ‘static site generators’, pre-process all content, applying templates before publication to generate web pages. Since pre-processing systems do not require a server to apply the templates at request time, they may also exist purely as design-time tools. These systems apply templates on-demand. They may generate HTML when a user visits the page, or the user might receive pre-generated HTML from a web cache. Most open source WCMSs support add-ons that extend the system’s capabilities. These include features like forums, blogs, wikis, web stores, photo galleries, and contact management. These are variously called modules, nodes, widgets, add-ons, or extensions. Some systems combine offline and online approaches. Some systems write out executable code (e.g., JSP, ASP, PHP, ColdFusion, or Perl pages) rather than just static HTML. That way, personnel don’t have to deploy the WCMS itself on every web server. There are tons of themes and plugins to choose from. They can be used to create any type of website imaginable for any size audience. We can build with a standard theme or use a builder and create our own layouts. Support comes from various services we purchase separately. We’re responsible for all maintenance. A website can be set up quickly and easily. We don’t have to worry about maintenance, security, backups..
They’re not suited for all website needs. We can’t move the site to a new host. We might not own the domain. Speed of website creation in a visual editor (from several hours and up to a couple of days). Technical support provided by web developers. Extensive opportunities of creating different types of websites, ranging from blogs and up to online stores. Rich choice of extensions for advanced functionality. Website editor available in visual and HTML regimes, which allows users to learn HTML basics. Serious restrictions in editing website code structure. Inability to transfer a website to another hosting or website builder. Necessity to learn programming languages to interact with the system, including template change, addition of new widgets etc. It is a user, who is responsible for the condition of the system, its safety and updates. We Meet Publication/Client RequirementsWe architect the Content Management System for our clients depending on the publication requirements.Some of the essential features that we deploy in the CMS are:SEO friendly URLs of the web pages.Online help.Group and user functionality.Support for changing template designs.Installation of various wizards and their up-gradation.Audit logs & all other features as required by the client.